Your arm, it's missing something. It just seems a little lonely. You know, with no bracelets and all. Maybe you should throw your arm a party! Sounds crazy, right? Well, this is how you do it. An arm party is all about wearing a plethora (that's right, plethora) of bracelets. You want ones that mix and match together quite well. You want ones that go great with any outfit. You want ones that you can wear with your Harley Quinn cosplay! Now, you can throw an arm party for your arm with this Harley Quinn arm party bracelet set. It comes with 5 different bracelets that feature different designs based on the crazy Batman villain. One bracelet is a thin cord with a red charm on it. 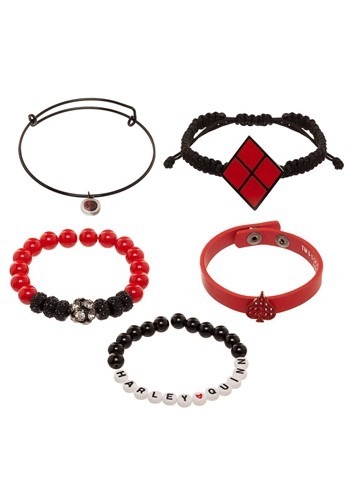 It also has a red and black beaded bracelet and a black bracelet with "Harley Quinn" spelled out in beads. It also comes with a red bracelet with a spade emblem and one more with a diamond emblem. You can wear all 5 at once, or mix and match them with any outfit. Whether you're just adding a little DC style to your outfit, or you're trying to put a new spin on your Harley Quinn cosplay this bracelet set is exactly what you need.